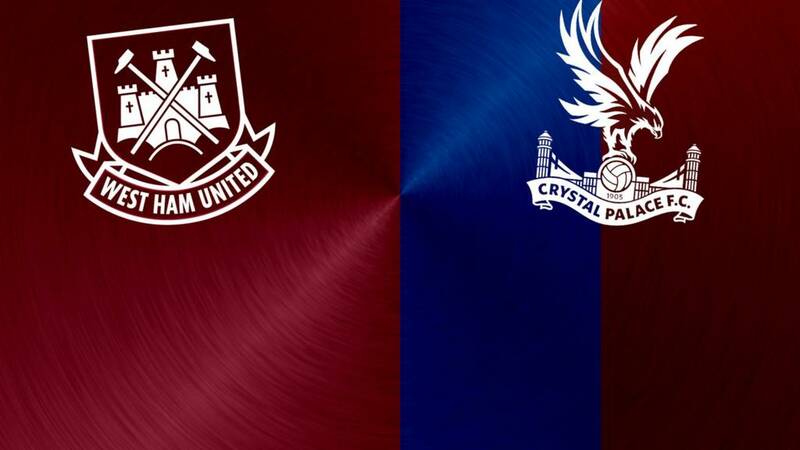 Crystal Palace: Hennessey; Ward, Dann, Delaney, Souare; Zaha, Puncheon, Jedinak, Ledley, Sako; Bolasie. So we will end our live page there. The report is up on the website now and can be viewed here. For all the reaction to today's games, follow our live text commentary here. Boos ring round Upton Park, but they are not for the Hammers players. They are for referee Mark Clattenburg, whose decision to send off Cheikhou Kouyate changed this game. West Ham looked reasonably comfortable, but conceded an equaliser shortly after Kouyate was sent off for fouling Dwight Gayle. The point does not really help either side, with West Ham drifting further from a top-four finish, while Palace remain in relegation trouble. Four minutes of added time. Who is going to win this one? It is getting frantic at both ends. Both sides still pushing for three points. Great entertainment. They might only have 10 men, but West Ham are still creating chances. Substitute Enner Valencia's side-footed effort is deflected over the bar by Pape Souare for a corner, which the Hammers waste. "West Ham panicked in defence. They didn't clear the ball and it ended up in the back of their net. But make no mistake, Mark Clattenburg's incorrect decision to send off Kouyate has changed the course of this game." JavelBleach: YES! Crucial time for #Gayle's 1st goal of the season! #Palace well on top now! qweasdasd: We're not going to make top four and it will be the fault of the refs. How big will that sending off prove to be in West Ham and Crystal Palace's seasons? The Eagles are now level. Pape Souare's cross finds West Ham defender Angelo Ogbonna, who makes a complete mess of the clearance. The ball hits a team-mate and falls to Dwight Gayle. The striker steers a finish past Adrian and we are all level at 2-2. Crystal Palace are not messing about. They know this is now a great chance to pick up some points against a side that will have to play for more than 20 minutes with only 10 men. Alan Pardew opts to bring on striker Fraizer Campbell in place of midfielder Joe Ledley. "I'm not sure that is a straight red card at all. It is a poor decision. If Kouyate had dived in with his studs showing that would have been a sending off, but he's got his leg bent and he's trying just to nick the ball." Not the best few minutes of Cheikhou Kouyate's career. He nearly gifted Crystal Palace a goal with a short backpass a few minutes ago and now he is trudging off the pitch. He lunges at Dwight Gayle and catches the striker. Clumsy, but not dangerous. But referee Mark Clattenburg does not hesitate and shows the midfielder a red card. It looks a booking, but a sending off seems very harsh. Off the line by Aaron Cresswell to deny Bakary Sako. Cheikhou Kouyate is a very lucky man. His backpass is too short and Adrian sprints off his line to partially clear the danger. However, the ball falls to Sako who shoots at goal but his effort is blocked by an acrobatic Cresswell clearance. West Ham have never played Champions League football. Well, not yet anyway. Hammers fans will be hoping that Europe's elite will be heading to the Olympic Stadium next season. If this score stays the same then it will certainly keep them in contention. For the fifth game in a row, West Ham look to the big man Andy Carroll. He comes on for Emmanuel Emenike. Not a sight you want to see if you're a Palace defender. A chance for Manuel Lanzini to score his second goal of the game, but his low strike is held by Wayne Hennessey. This gives you an idea of Dimitri Payet's free-kick towards the end of the first half. That goal may well be earning the Hammers the win here. Great defending from Angelo Ogbonna at the near post to deal with a Bakary Sako cross as Jason Puncheon waited to pounce. This has been a good start to the half from Palace, and West Ham's defence are going to have to be on their game for their side to stay ahead. Crystal Palace's Yannick Bolasie tries a few fancy stepovers on the left-wing, then tries to sprint past Michail Antonio, then tries to barge him out of the way. But nothing works as the ball dribbles out of play for a goal-kick. Good work from Antonio, who has impressed in an unfamiliar right-back role, both in defence and getting forward to help the attack as well. So what do Crystal Palace have to do to get back into this game? Well, getting hold of the ball may be a good start. We are back under way at Upton Park.